Why has Xena walked such an incredible path in life? Is there more behind the horrible events of her past than simply bad luck? Ian Rentoul thinks he has the answer. It would seem that Xena's 'destiny' (or her eventual raison d'etre) is to be a heroine. That is, a person who is admired for great deeds and noble qualities. It is a person who carries out deeds that affect the lives of those around her for their greater good. 'Destiny' itself can be described as 'the power that foreordains and that which predetermines a course of events'. As the character of Xena is so strong, it is hard to imagine that anything would set her on a course other than that which she chooses. However, her life is not totally of her own making, and decisions she makes are a result of interacting with other people and reacting to the decisions they take. It appears to the author (from what is known to date) that six events stand out clearly as landmarks in the development of her character and thus have had an overwhelming effect on her life. The 'opportunity' provided by the Three Fates to experience an alternate timeline. Many are of the view that destiny is simply another name for 'chance', 'luck' or 'self-will', but to truly understand the nature of destiny, it is necessary to recapitulate in somewhat greater detail the brief descriptions set out above. Information regarding the initial attack on Xena's home village is somewhat sketchy. What are known however, is that a warlord named Cortese threatened Amphipolis; that Xena amassed an army, which included her younger brother Lyceus; and that her army was victorious. Victory was not without loss, however, and Lyceus was killed. Further, little is known of her life before this incident, save that her family came from Amphipolis, which was a village on the borders of Thrace and Macedonia. She was born to Atrius (her father and a warrior who deserted the family when she was young) and Cyrene (her mother). Xena also had an older brother, Toris. If the threat of Cortese had not manifested itself therefore, it is likely that she would have lived out her life as a peasant girl, probably in a similar manner to the early life of Gabrielle. It appears that as a form of defense for her village, Xena, now leader of a large army, started to conquer the surrounding villages. This was to provide an area of protection or buffer, which ensured any threatening armies could be met and repelled on her territory before reaching Amphipolis. Her initial intention of defending Amphipolis from attack and destruction was no doubt laudable, but moved her into the realms of 'it will never happen again' and eventually made her no better than Cortese against whom she originally fought. The following years were spent 'on the road' leaving behind her village and leaving behind Petracles a warrior with whom she was involved. Xena was not adverse to a little kidnapping and ransoming. At about this time, she met and was trained by a slave called M'Lila. It was she who taught Xena the now-famous nerve neck pinch. On one occasion she ransomed the life of a Roman, Julius, later to become Caesar. Xena and her Roman hostage become lovers. Seduced by him and his grand visions of power, Xena believes she will join forces with Julius. He leads her on, and she releases him. Ruled by her heart and not by her head, she makes a fatal mistake. Julius is returned and Xena receives her ransom and expects to join forces with him later to conquer the world. On being freed, Julius reneges on all that he has allowed her to believe. He tracks her down and his Roman forces defeat her army, taking her prisoner. Her punishment (and those of her followers) is crucifixion. While Xena is tied to a cross, Julius Caesar orders a solder to break her legs. However, Xena is saved by M'Lila, and taken by M'Lila to the healer, Nicklio, to recover. Julius Caesar's soldiers eventually find M'Lila and Xena. M'Lila dies in the attack, sacrificing herself for Xena. Despite her injuries and spurred on by the death of her savior and friend, Xena fights the Roman attackers and kills them. Clearly shocked by the pain that she has had to endure, by what she has witnessed and the loss she has suffered, as the last of the Romans is put to death, Xena passes on a message to Hades through him. The keeper of the Underworld had better be prepared for a lot of business, as "A new Xena is born tonight with a new purpose in life -- death." This Xena, quenching her thirst for death, destroyed towns and villages. In the midst of this carnage on a quest for the Ixion Stone she pitted her army against the Centaurs. She also had a son, Solon, to a warrior named Borias. Borias was killed, and in her grief she agreed to leave the area if Kaleipus, one of the Centaur leaders, brought up her son as if he were his own. Solon never knew who his mother was. Adventures followed including meeting Goliath in Palestine, who saved her life. Xena faced the Centaurs again at Corinth after returning to Greece, and she also went head to head with Bacchus, fought in the Battle of Torentz and burned down a village called Cirra killing all but a few of its inhabitants. Among the survivors was a child named Callisto. This desire for conquest eventually meant that Xena would face Hercules. The first time we meet Xena in the TV series is when she is plotting to kill him. The logic here is uncertain, but it is assumed that if she had his head as a trophy, no one would dare oppose her again. After all, she would be the slayer of the mightiest man in the known world. Her conquests had got her as far as Arcadia, but she travelled to Thebes (Hercules' hometown) to carry out the first part of her plan. Hercules' sidekick Iolaus was feeling down on his luck woman-wise and met Xena who exploited him to get at Hercules. She then took Iolaus back to Arcadia, telling him that she needed his assistance to help build an army to defeat a warlord known as Petrakis. The cunning plan was to turn Iolaus against Hercules, have them battle one to one and see if Iolaus could defeat him. If not, then Hercules would have to kill Iolaus. Here, the theory is that whilst so mortified with grief following the death of his friend at his own hands, his guard would be let down sufficiently for Xena's army to kill him as well. It seemed a good plan on paper. However, Xena made one mistake. She sent one of her lieutenants to attempt to kill Hercules at his mother's home. This soldier failed, and Hercules realized that Xena had a hidden agenda and set out to save his friend. After Hercules arrived at the encampment in Arcadia, Iolaus was ready to go one-on-one with Hercules, having been seduced by Xena. They fight. Iolaus was thrown to the ground and was ready to meet his fate. In an act of compassion, however, Hercules spared the life of his friend and, after the two reunited on the same side, conducted a short fight with the somewhat rag-tag army of Xena. Xena escaped after seeing her plan in tatters. What happened between her riding off into the sunset vowing to have another go at Hercules and when we next see her is unclear. She did, however, raise another army. Her lieutenant in chief was a thoroughly unpleasant character known as Darphus. Despite her reputation, Xena had a code of conduct which prohibited her or her army killing women and children. It soon became clear that Darphus had no such code. Whilst Xena was away with a scouting party trying to locate Hercules, Darphus took matters into his own hands and attacked a village. Xena returned whilst the attack was in progress, but the only inhabitant that could be saved was a baby. A somewhat unexpected character now takes a hand in the process. Xena, who spared his life, had previously taken prisoner Salmoneus, the famous travelling toga salesman. He acted kindly towards Xena and arranged for the baby to be looked after. However, Xena's act of compassion allowed a power hungry Darphus to seize an opening and turn the army against her. The warriors decided that she must leave. There was only one way for a warrior to do this -- by walking the Gauntlet. Without armour, Xena is required to walk and fight her way through two ranks of her former army. Each man carries rods that they use to pummel her into submission and what is planned to be her eventual death. No one had ever survived the Gauntlet. However, she did survive, and the army allowed her to leave, much to the disapproval of Darphus. She was now on her own, but Hercules was also on her trail, being warned of her return by his cousin whose village was threatened by her. On the road to battle with Xena, Hercules met Salmoneus. At first, Hercules did not believe his old friend when Salmoneus said that Xena was not as bad as Hercules thought. Salmoneus warned that Darphus was the real danger. Shortly afterwards, Xena and Hercules met. They fought, and Xena was defeated. Her life was spared, however, and she left to contemplate her fate and the events that had just taken place. Having heard from Salmoneus of Darphus' evil intent Hercules struck out after him. He entered into battle with the remnants of what had been Xena's army and whilst so engaged, Xena reappeared to lend support to Hercules. Darphus was defeated, ran through by the Warrior Princess herself. Now reconciled, Hercules and Xena set out on the road "to find out what's out there together", but Ares had other plans and restored Darphus to 'life'. Xena and Hercules faced Darphus again along with Salmoneus and Iolaus, defeating Darphus a second time and dispatching Gragus, Ares' pet dog. Xena then decided that her life had to totally change. She felt like she had to make amends for her previous evil, and she set out alone to return to Amphipolis and an uncertain welcome, discarding her armour and weapons en route. On the road back, she rides near a village called Poteidaia. One of the residents is a young peasant girl named Gabrielle, betrothed to Perdicas. The village is threatened, and about to be pillaged. The women, Gabrielle included, are about to become slaves. Xena, changed in character, recovers her armour and weapons, saves the village and leaves. Here we have witnessed Xena's first good act -- that of rescuing Gabrielle and the other villagers. By rescuing Poteidaia, Xena also met Gabrielle, who was bored and tired of her way of life and followed Xena. Xena was irritated by Gabrielle in Poteidaia and was happy to see the back of her. Xena did not know that Gabrielle was following and was the first to arrive at Amphipolis, which was now threatened by a warlord named Draco. 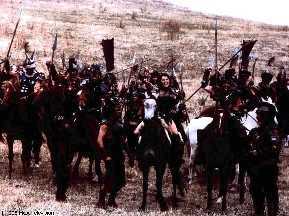 The Amphipolians believed that the army outside their village belonged to Xena and were about to kill her. When Gabrielle arrived, she managed to 'talk' her and Xena's way out of a mob that had begun to stone Xena. Xena fought Draco and vanquished him. Later Xena left her home village with Gabrielle in tow. In the reverse of a Shakespearean tragedy, where the hero is brought down by a flaw in his own character (for example, Coriolanus in a play of the same name and Mark Antony in ANTONY AND CLEOPATRA), or indeed, a Greek Tragedy, Xena has apparently triumphed over her flaw or, at least, learned to work around it. In CORIOLANUS, the title character is at first a great Roman general and war leader. Following one of his campaigns, he returns in triumph to Rome and on a tide of popularity, turns his back on war and battle to become a politician and to do good. Unfortunately, he is seduced by power and corruption. The flaw in his character -- and here is the tragedy -- leads him down a path where his downfall is assured. He simply cannot cope and it ends in his death. This seems to be the antithesis of the Xena story. It is her strength of character which pulls her through. It was the weakness in Coriolanus' which was to lead to his death. Xena is saved from herself by her own character, which reacts positively to the events that surround her. Are these all conscious acts of self will, or are they forced upon her by the will of others? Is she reacting to them in the only way possible, or is she making the best of a situation in which she has found herself as a result of the actions of others? If Cortese had not attacked her village originally, she would not have raised an army and her younger brother would not have been killed. Equally, she would not have found it necessary to have conquered the surrounding villages and started on the downward slope that eventually led her to the darkest part of her life. Had she not taken that course in her life, she would not have honed her fighting skills, met M'Lila nor eventually gone head to head with Hercules, one of the three friends (the others being M'Lila and Gabrielle) who most profoundly affected her life. It is fascinating reading through the history of Xena's life to see how events dovetailed leading to meeting Hercules who eventually set her out on the path to redemption and heroism. This was then followed up by meeting Gabrielle, who reinforced that journey becoming her closest friend and confidante. What if these events had not occurred. My last topic from the six above set out for consideration illustrates an insight into what might have been, and thus would have banished all possibilities for Xena to fulfil her destiny as a heroine. In the incident detailed below, Xena also appears to take a decision as to the course of her life. Alternatively, depending on the view taken, it could be argued that as a result of the situation that faced her, she had no other choice except to do what she did. Xena made one of her annual pilgrimages to the Temple of The Three Fates where she prayed for the soul of Lyceus, her dead brother. While there, the Temple was raided, and both she and Gabrielle found themselves in a fight for it's defense. One of the attackers was a young boy, killed by Xena with a blow from a sword. Seeing Lyceus in the boy, she was overcome with grief and returned inside the Temple. There, she encountered the Three Fates. Xena expressed her regret and stated "I want that boy's life back", and "I wish I'd never followed the sword in the first place". She also said that she wished that she had never become a warrior. The Three Fates reward her for saving the Temple by catapulting her into a different timeline where she had her wish. Here, she never became a warrior. The Fates warned her that if she ever spilled a drop of blood in anger, then her life would be returned to how it was before. In her 'new' life, she was a peasant girl again, living in Amphipolis. Lyceus was alive, but her mother, Cyrene, was dead. She was also betrothed to Maphias. Life looked good initially, but as she learned more about this new existence Xena became less satisfied . She discovered that Gabrielle existed in the new timeline, but instead of being the spirited girl she was in the old existence, the new Gabrielle was bitter, angry and 'owned' by a slave dealer known as Mezentius, who Xena had killed in her 'old life'. Further, the Centaurs and the Amazons were both enslaved. Xena realized that in her haste to undo all the evil acts which pervaded her early life, all the good that she had achieved since her encounters with Hercules had also been wiped out. Still aware of her old life, Xena could not sit by and watch this. She concocted a successful plan to free Gabrielle; but she, Gabrielle and Lyceus were captured and thrown into jail. Xena had up until this time managed to resist spilling any blood in anger, but it was rapidly becoming more and more difficult. The three challenged Mezentius and his guards, and several other warlords, and a fight ensued. Two events then occurred which proved to Xena that she could not change her fate or destiny, no matter how much she wished she could. Gabrielle, angry and bitter, seized an opportunity to kill Mezentius, picking up a sword and running him through. Xena was shocked to see this act. It was an act which 'her' Gabrielle would not have contemplated, having vowed never to take a life. Further, whilst fighting alongside Lyceus, he whispered to her "Don't fight destiny". This was too much for Xena and seeing the character of her friend changed beyond recognition, she grabbed a sword and plunged it into one of the guards. The effect was instantaneous. She was returned to her old life and everything was put back to the way it was. She had learned not to fight her Destiny. Despite efforts to maintain her 'new' life, the call of her old life was too much for her, and she resigned herself to her 'fate'. By so doing, Xena reinforced the premise that no matter what she tried to do to change that which was past, eventually, she must surrender to it. This therefore takes us back to where we started. Tangible or intangible, Xena has been guided on a course through previous events in her life. My suggested 'top six' are set out above for debate. You might have other events in mind. However, no matter which events you choose to name as the forces of destiny, the events effectively set her up as a heroine to 'carry out deeds that result in affecting the lives of those around that person for their greater good'. We learn of M'Lila and Julius Caesar during a period of time when Xena was close to death, and eventually died. After her death, Xena's spirit left her body. At this time, M'Lila's spirit came to Xena and told her that she must now choose her own destiny. M'Lila said that Xena still had a task to fulfil if she so chose and that it was to fight evil. M'Lila said that as she knew the nature of evil, who better than she to oppose it. Xena was also told that the dead can hear the thoughts of the living. Xena heard Gabrielle 'praying' in an occurrence similar to that the time when Gabrielle, very much alive, overheard Xena praying to 'whoever was listening' to preserve and spare her companion when Gabrielle was consumed by rage over the death of Perdicus at the hands of Callisto. Now it was Gabrielle's turn to pray. "You can't leave me, Xena," Gabrielle said. "I know it's not your time. I can feel it in my heart. I just feel this emptiness that I've never known before, and it scares me. Xena, above all, remember your destiny. Remember it and fight. Fight to come back! This world needs you. I need you." Xena chose to come back. "I have to go back", she said. This one decision perhaps more than any other casts Xena in a new light. Until now we have seen her on a path of personal redemption. After the episode DESTINY (#36), Xena had a true mission with far greater consequences for the world than previously. This 'enlightenment' during the period of her death changed her and perhaps brought the narrative at the beginning of each episode perhaps into more perspective. "She was Xena, a mighty princess forged in the heat of battle...Her courage will change the world." While the story of Xena is still being told, we can but speculate on the ultimate 'destiny' of our hero. The Xena Scrolls were found in Macedonia in 1942 and excavated by Janice Covington, a descendant of Gabrielle. When a woman named Melinda Pappas (who looks very much like Xena) visited the site, the two women met and started a chain of events that may point to Xena's ultimate mission. At the time, it was not known that Ares had been imprisoned in the tomb where the Scrolls were discovered, although it was believed that the tomb was cursed. By accident, Ares was released and Xena's spirit, took over Melinda's body and a fight ensued. 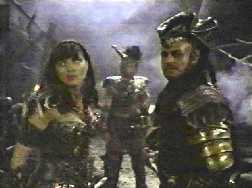 Xena managed to return Ares to where he was imprisoned and released Melinda's body to her once more. Is this Xena's true destiny? With the knowledge that at the time of her 'first death' M'Lila told Xena that her destiny was to fight evil, and with the knowledge that Xena's spirit eventually turned up as Ares' jailer and guard, the question has to be asked: Was everything leading up to being the jailer of the ultimate evil - Ares, god of war? If this was the case, it should be remembered that Ares was Hercules' half brother, and it was he who 'turned' Xena away from evil in the first instance. This is a nice twist. Perhaps it should be considered that Hercules was also an unwitting pawn in the development which ultimately saw his 'creation' -- the good Xena -- watching over Ares, with whom Hercules had fought and defeated on a number of occasions. Was all that Xena endured testing her for this ultimate mission? Was her life mapped out for this challenge? Did Ares know that this was her mission? Was this why he was so desperate to have her turn away from good and return to him by taking up her evil ways again? If this was her ultimate mission, who was standing behind her guiding her? In the author's opinion, it is highly likely that the one moment in her life when she was finally set sail for this mission was when she took the decision to return to life after having been told by M'Lila that it was her destiny to fight evil. Why did she return when her spirit could have been held in limbo until the time when Ares was imprisoned? I think it was a mixture of the call of duty and remembering how she had felt when she thought that she had 'lost' the Gabrielle she knew following the death of Perdicus. Which of the two was the stronger to draw her back from death, we can only speculate. So, ultimately, what is 'destiny'? I have submitted a definition for discussion. Whether it is a power that foreordains (as I have suggested), luck or chance, I leave that for the reader to decide. Each must come to his or her own conclusion and the door is once again left open for that discussion. Maybe at sometime in the future, that which truly controls Xena's life will be revealed.